Have you ever experienced the need to tell someone not to mess in your affairs? I bet you have. There are so many cheeky people that I think everyone has been in such a situation. I really hate when people start putting their noses into my business. 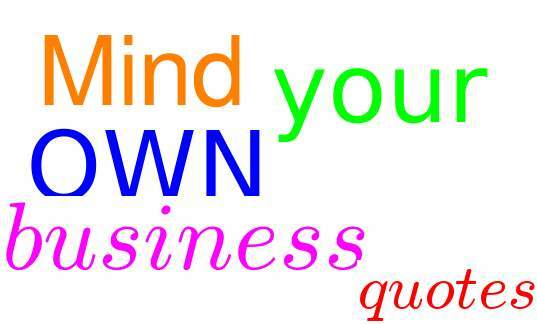 If you are like me, here are some cool mind your own business quotes you can use the next time when you need to tell someone to take care of his/her own things. These are some of the coolest and most popular quotes on the matter, so I think you will enjoy them. Great minds discuss ideas, average minds discuss events, small minds discuss people. – by Eleanor Roosevelt – American politician, diplomat and activist. 1. My life, my choices, my mistakes, my lessons… Not your business! 2. Hey, I found your nose, it was in my business again. 3. Stop telling me what to do, start telling yourself to mind your own business. 5. 2 rules of business: 1: Mind your own 2: Stay out of mine. 14. It’s a nice day for you to start minding your own business. 15. If you spent a little more time minding your own business you would have a lot less time to be minding mine. How do you find this post? If you like it, you can share it with friends and support our site this way. For some more quotes on the matter, you can see here.